For patients who see their dentist every six months, what happens at a general dentistry appointment is no mystery. But if you’re a patient who has put off care because of anxiety or a busy schedule, you may not know what to expect. That’s why, in today’s post, we’d like to detail what general dentistry is about and why it’s important. 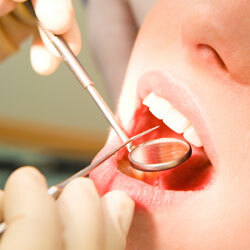 Prevention is one of the primary purposes of general dentistry. That’s why Dr. Dalia Georgy and Dr. Parnam Mohanna recommend coming in for a regular exam and cleaning twice a year. With this kind of frequency, dentists can watch for gum disease, cavities, TMJ dysfunction, or oral cancer, and if anything is found, can put together a treatment plan for it immediately. How will Dr. Georgy and Dr. Mohanna look for each of these? With a thorough oral evaluation that includes a traditional visual exam paired with the use of digital X-rays. The combination of these two will ensure that your doctor spots these changes early, before they have a chance to before more serious. When care is provided early, more of your natural smile can be preserved, benefiting you in the long run. If you brush and floss regularly, you may wonder why professional cleanings are important. The answer is simple—even though home care is the first line of defense against common dental problems, the tools that a dental hygienists uses can clean away plaque and calculus better than brushing and flossing alone. As a result, you can look forward to having a cleaner smile. As with exams, you should see your dentist about a cleaning twice a year. Has it been more than six months since your last general dentistry appointment? Call Complete Cosmetic Care Dentistry in Sapulpa to reserve an appointment with Dr. Georgy or Dr. Mohanna today.